Spanish demonstrators demanding universal basic income. As a long-time proponent of basic income, and as someone who has been involved in pilots in four continents, the past year has been a roller coaster, perhaps summarised as two steps forward, one step back, with marks for progress as six out of 10. It will take acts of courage to move forward decisively in 2019, but more doors are opening. There has been a ferment of activity. Perhaps what has happened in Canada and the United States captures the contrasting fortunes best, though events in Europe and elsewhere are encouraging too. A highlight was the 18th international congress of BIEN (Basic Income Earth Network) in Tampere, Finland, which brought hundreds of academics and activists from around the world to discuss developments. There were also several significant books, and the World Bank endorsed basic income as a development tool in its World Development Report. The debate in Canada and the USA has gone in two directions – the introduction of basic income as an alternative to existing social policies, paid from direct taxation, and the development of capital funds with dividends. The first have been implicit in pilots and demonstration projects. At the outset of the year, basic income pilots were underway in three communities of Ontario (Hamilton, Lindsay and Thunder Bay), covering 4,000 individuals. Though, like most other experiments, these were not tests of a full basic income, they had many features of a proper basic income. Early reports were uniformly favourable, and polls showed it was popular, so much so that the Conservatives contesting the Provincial election said the pilots would be continued if they were elected. However, on taking office, Doug Ford terminated the pilots and ordered that data collected for the evaluation be surrendered. Undaunted, videos circulated on social media reporting on how participants had been responding. There was also an unexpected postscript. In December, the Canadian prime minister, Justin Trudeau, and the social development minister, Jean-Yves Duclos, said in interviews that a guaranteed national minimum income could be an option as they sought ways to support Canadians to adapt to an unsteady, shifting labour market. Duclos predicted it would come. In the USA, Barack Obama, in a reflective speech in South Africa, mused that basic income would figure prominently in the years ahead, and prominent corporate folk endorsed it again, including Mark Zuckerberg and Elon Musk. But mainly it was a year of positioning by potential Democrat presidential candidates, with contenders offering proposals with elements of basic income. One, Andrew Yang, has made it his core policy proposal. There was an encouraging buzz around the pronouncements of the young mayor of Stockton in California, who has taken a different route, launching a demonstration project whereby – thanks to a grant of $1 million from Facebook co-founder Chris Hughes – 100 individuals from low-income areas will be provided with a monthly basic income of $500 for 18 months. The project was held up by the process of sending invitations to 1,000 randomly chosen individuals from which the 100 are to be selected. But it should go ahead in February 2019. In Chicago, a large group of legislators has proposed a pilot, and at the end of the year the proposal was awaiting the approval of the mayor. If it takes off, it will be the largest such pilot in the USA. Also encouraging is the pilot launched in four American cities, in which 1,000 low-income mothers will receive an unconditional $333 a month for 40 months from their child’s birth, in a project named Baby’s First Years, because the focus is on the link between basic income security and brain development. In another pilot, also best described as a demonstration project, the Magnolia Mother’s Trust started to provide 15 low-income African-American women in Mississippi with $1,000 a month, unconditionally, in December 2018. Although it took place in 2017, another development that crystallised in 2018 that could become a harbinger of responses to natural and social disasters was the response by Dolly Parton, the country music star, to the wildfire devastation of her hometown of Gatlinburg, Tennessee. She put millions of dollars into My People’s Fund, from which $1,000 per month was to be paid to about 900 families for six months. So many other donations were made that this was increased to $5,000 in the final month. An analysis showed that the money not only enabled people to acquire housing, but led to increased work, not less. Meanwhile, leading Democrats were tumbling out proposals. Senator Cory Booker introduced a bill proposing that lower-income children receive $1,000 each year, paid into special savings accounts, with the amount rising to $2,000 if their families are poor, paid by higher capital gains and estate taxes. The accounts would be blocked until they reached age 18, when they would be permitted to use the money for “asset building” purchases. This deviates from a basic income, being paternalistic, not trusting people with the ability to decide what was best for themselves, would require costly bureaucratic monitoring, and would raise the problem of “weakness of will”, as is the case with all capital grant schemes. But it reflects the realisation that the distribution system has broken down. Senator Kamala Harris put forward a bill to subsidise rent through a refundable tax credit on federal income taxes, which was quickly seen as more likely to enrich landlords than give basic income security to low-income tenants, critics pointing out that a basic income would do more to help those tenants. Harris proposed the LIFT (Livable Incomes for Families Today) the Middle Class Act, offering $250 a month for singles, $500 for couples, phasing that out as earnings rose. A drawback is that somebody earning nothing would receive nothing, while somebody would need to earn at least $3,000 to receive the full benefit. Representative Bonnie Watson Coleman proposed a bill designed to overcome one regressive failing of the Earned Income Tax Credit scheme that currently eats up $65 billion a year. It would extend EITC benefits to family caregivers and students. Like tax credits elsewhere, the EITC has rested on an arbitrary conceptualisation of what is work and what is not. Recognising that is at least a step in the direction of a basic income. Tax credits are regressive, depressing wages and subsidising low-wage employers. Meanwhile, there have been developments around the second route to basic income, around social or common dividends. Again, there has been one setback. The starting idea is that natural resources are part of the commons; they belong to everybody, the commoners. If anybody or a corporation exploits them for commercial gain, they owe a “rent” to the commoners. This view goes back through the centuries, epitomised by the thinking of philosophers such as John Locke and the founding fathers of the United States, such as Thomas Jefferson and Thomas Paine, and through the writings of Henry George and later economists. This has led to renewed interest in land value tax, eco taxes or levies and digital levies. But the main examples in practice have been based on royalties on oil. The leading scheme where royalties are channelled into a permanent capital fund from which equal dividends are paid is the Alaska Permanent Fund. Set up in 1976 and paying annual dividends to every Alaskan resident since 1982, this has proved remarkably popular. Until 2011, the value of the dividends rose steadily. But successive Republican governors had imprudently cut income tax to zero. So, when oil prices fell, government debt rose, leading to the most recent governor raiding the fund to pay government operating costs, leading to a collapse in the annual dividends. This was rightly seen as a tax hitting low-income people, and led to a dive in the governor’s popularity and withdrawal from his re-election campaign in October 2018. The revival of Alaska dividends will depend on who succeeds him. But the idea of capital funds is gaining ground. The major development in 2018 was rising support for taxes on greenhouse gas emissions. The global scientific community is unanimous that climate change is a giant threatening humanity and nature, and that radical action is required to tackle it. Among other measures, that requires big taxes or levies on C02. There are two problems: taxes are unpopular, and carbon tax is regressive. In 2018, Canada moved to confront both problems, by combining a carbon tax with the promise of dividends to be paid to all, under the Greenhouse Gas Pollution Pricing Act, starting in 2019. The carbon tax is too modest to bring down emissions substantially, but the act has established a principle, although the oil industry is contesting it and, predictably, the right-wing Ontario premier Doug Ford has called it “the worst tax ever”. The new tax will increase gasoline prices by 42 cents a gallon (11 cents a litre), or by 8%. But cleverly the act is intended to be revenue-neutral, with all revenue returned to the provinces from which it is generated, and with 90% given back to individuals as rebates, the remaining 10% going to organisations affected by the tax, such as schools and hospitals. The rebates will mean that about 70% of Canadian households will receive more back than they pay in tax. This is, in all but name and certainty of amount, a basic income, and it is progressive. In November 2018, a bipartisan group in the US House of Representatives introduced a bill similar to the Canadian reform, proposing to tax emissions and redistribute the proceeds as dividends. It will be doomed as long as Donald Trump’s fellow climate-change deniers control the Senate. But it too offers a promising route into funding a basic income system. A similar plan has been promoted by former government officials backed by major corporations such as AT&T, P&G, Johnson & Johnson, GM and PepsiCo, and financially backed by ExxonMobil. So, in North America the idea is taking hold that revenue can be raised from commercial uses of the commons, or natural resources, and from commercial deductions from the commons in the form of pollution. Observers should note related proposals. In Chicago, the innovative alderman Ameya Pawar floated a plan to ‘public-tize’ Chicago’s water system, giving shares to all city residents and paying them dividends that would be a sort of basic income. According to him, as Chicago has a lot of fresh water, it should be seen as a public resource just as oil is treated in Alaska. Finally, the US debate has been accentuated by the proposal by newly elected New York representative Alexandria Ocasio-Cortez, backed by at least 40 members of Congress, for a Green New Deal, which includes a monthly basic income. No doubt the deal will prove controversial in its original form. But it surely points in the necessary direction. While proposals were bubbling in North America, European debates became more prominent, and more politicians and political parties came out in favour. While US economist Joseph Stiglitz has dismissed basic income in the UK, saying “It is a cop-out. I do not believe it is what people want,” there is evidence to the contrary. A Populus survey in Britain found that 41% supported basic income, and only 17% were against, the remainder saying they did not know. A European-wide survey covering 23 countries found strong public support across the continent. The most striking development came in Italy, leaving basic income proponents with mixed feelings. The populist party Movimento Cinque Stelle campaigned in the general election on a platform that included what it called a basic income, which proved remarkably attractive in southern Italy, and has been described by most analysts as the main reason for their success in becoming the largest party in parliament, and now part of the government. What M5S is offering is actually not a basic income, but the fact that it proved so popular was further evidence that some of its critics are out of touch. Pilots have been spreading. In 2017, there was worldwide publicity around what was purported to be a government basic income pilot in Finland. In mid-2018, the BBC and the Guardian newspaper almost gleefully reported that it was being ended prematurely. This was reported in media around the world and repeated in blogs on social media. The story was wrong. The original intention, announced before the pilot begin in 2017, was that it would last for two years, up to the end of December 2018. This is precisely what happened. Journalists had misinterpreted a statement by a new, right-wing finance minister that the pilot would not be extended because he was opposed to it. The government moved towards a workfare regime, requiring all unemployed to attend trimonthly interviews, and increased the waiting period for receipt of unemployment benefits and the period of eligibility. A utilitarian approach was in ascendancy, in which a more punitive regime closer to the UK’s Universal Credit system was being implemented, which led to thousands losing entitlement to social assistance. But this had nothing to do with what was happening in the basic income pilot. The Finnish pilot is not testing proper basic income, but is a test of characteristics consistent with it. It provided €560 a month to 2,000 randomly selected registered unemployed from across the country, relaxing the rule that they must prove they are searching for jobs and allowing them to retain the benefit if they found one. Early reports from the evaluation by KELA, the official social insurance organisation, are encouraging. A report will be published in 2019. In November 2018, the opposition party, Left Alliance, announced that its manifesto for the general election scheduled for 2019 would include a commitment to a basic income of €800 a month, phasing out means-tested social assistance, while leaving housing allowance unchanged. The basic income would be “taxed away” from high-income earners, and it would be phased in by consolidating various social security benefits. In the Netherlands, partial basic income pilots were under way in Groningen, Tilburg, Utrecht and Wageningen. The experiments follow from legislation in 2015 that allowed local authorities to experiment with social policies. Initially, the pilots seemed closer to workfare, but local authorities have found ways to make them closer to a basic income, although they suffer from being limited to welfare claimants and being provided only to randomly selected individuals, not whole communities. As in Finland, they are best described as “trust experiments”, to see how people respond when not subject to behavioural conditionality. Another experiment is underway in Barcelona, under the name B-Mincome, which has been running since October 2017 and is scheduled to last until late 2019. Again, its proponents see it as a basic income, but the money is being provided on a family basis, not individual. It is being provided to 1,000 participant families, with 500 others as a control group. When launched, it was stated that the main intention was “to analyse the most effective way of reducing inequality and breaking the poverty cycle”. In Switzerland, much attention was stimulated by an initiative by a Swiss film-maker to launch a pilot in Rheinau, a village in the canton of Zurich. The idea was to induce 650 residents to volunteer to be recipients, from a village population of about double that, and to crowdfund a rather large basic income for one year, varying the amount by age group. Those earning more than CHF2,500 would have to repay it as their income rose. As with the earlier Swiss referendum, the initiative suffered from putting the basic income at a high level, reaching as much as CHF2,500 for those aged over 25. At the end of the year, the crowdfunding was short. However, observers seem agreed that the initiative attracted much public support in the area. In Germany, a basic income pilot – provocatively named HartzPlus – is set to start in May 2019 in Berlin, with a random sample of 250 recipients of state benefits and with another 250 as a control group, with a focus on evaluating the impact on labor market behaviour, health and social relations. It is set to last for three years and follows crowdfunded schemes that have proven popular in Germany, notably Mein Grundeinkommen (My Basic Income) that has been running a lottery with winners obtaining a monthly basic income of €1,000 for one year. Meanwhile, the chief executive of Germany’s Association of Towns and Municipalities (DStGB), lamenting the over-burdened bureaucratic welfare state and rising poverty, came out in favour of basic income. In the UK, an initiative was launched in Scotland, where four areas (Fife, Edinburgh, Glasgow, and North Ayrshire) began preparing feasibility and design plans, aided by a grant of £250,000 from the Scottish government, and backed by a cross-party group of members of the Scottish parliament. The Green party has also come out strongly in favour of a basic income, and in mid-2018 the shadow chancellor of the exchequer committed Labour to proposing pilots in its next manifesto, and commissioned a report (by this author) on why and how those should be done. In sum, the debate on basic income has moved into the mainstream in European policymaking, probably propelled by concern over the eight giants discussed in the companion piece to this progress report. Among the findings of relevance to crystallise in the past year on both sides of the Atlantic is that a large and growing proportion of those in income poverty are in households in which at least one person is in a job – 80% in the case of the USA, 60% in the UK, for example. But high private debt, insecurity, inequality, precarity, concern over the advancing robots and worries about populism are surely behind the growing interest. Towards the end of the year, there was a buzz in the Indian media, around stories that Prime Minister Modi might include commitment to a basic income in the BJP manifesto for the general election in April 2019. Some MPs have come out in favour, and in several states local plans have been developed. These initiatives derive in part from the successful pilots conducted in West Delhi and Madhya Pradesh and a much-cited chapter in the minister of finance’s annual report in January 2017. It is widely accepted now that some sort of basic income for India is financially feasible. There have been political moves in several other Asian countries. Thus, the head of the Malaysian prime minister’s Council of Eminent Persons proposed that the hugely expensive subsidy system BR1M should be replaced by a national fund from which dividends would be paid as monthly basic incomes. In China, a national network was established to promote basic income, which has highlighted the success of a basic income scheme in Huaidi in Shijiazhuang. And in South Korea, the “youth dividend” scheme launched by the mayor of Seongnam City gained considerable popularity and political interest across the country. The biggest pilot took off in Kenya, where GiveDirectly launched its flagship scheme. This is set to last for 12 years, covering 21,000 adults, with monthly payments coming to about half the average income of low-income households. This obviously ambitious pilot is generating much interest. However, it will be years before evaluations of its impact will be available, and one should be concerned with research fatigue. What it has done is boost interest in basic income among policymakers everywhere. Besides the World Bank’s sudden conversion, revealed in its World Development Report 2018, various IMF papers have recommended basic income, again reversing previous IMF positions. And World Bank reviews of the evidence from across developing countries have refuted (again) arguments that cash transfers lead to more spending on private bads, more dependency and less work, and negative community effects, while being fiscally unsustainable. If only those financial bodies had not opposed those of us pushing for basic income for so many years, we might be further ahead today than we are. But it would be churlish not to wish them success in their advocacy in the year ahead. During 2018, discussion of the likely cost of a basic income became more informed. For instance, one study estimated that a 2% financial wealth tax would be sufficient to fund a $12,000 annual basic income for every US household. Studies in the UK suggested that by replacing many existing benefits and raising the income tax rate by 3%, a decent basic income could be afforded. Others estimated that it could be paid from levies on wealth, land value and incursions into the commons. 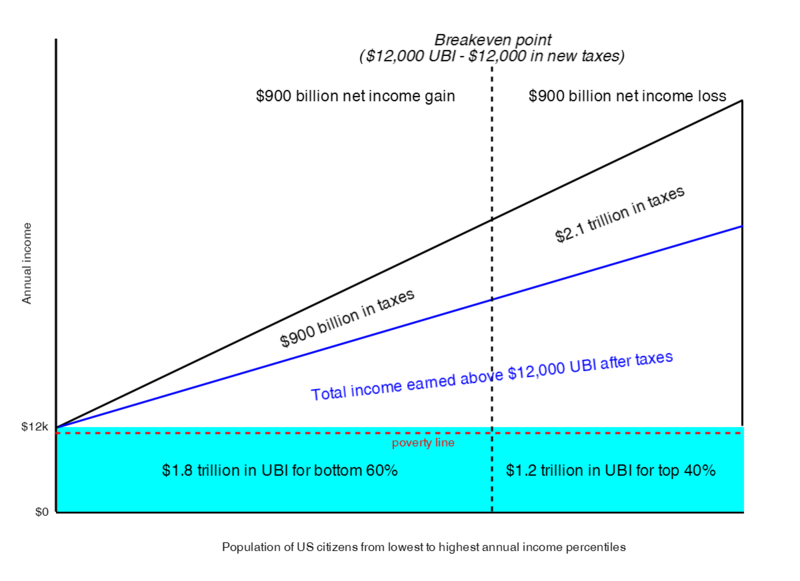 During the year, it became more widely appreciated that generous personal tax exemptions in the USA, and increasingly generous personal tax allowance in the UK, are a perverse form of basic income – an “upside-down income-support program – the rich get more than the middle class, and the middle class get more than the poor”, as one American commentator put it. This is in so much as they cost as much in public revenue as would a modest basic income but are regressive, since the gain in tax-free income is greater for higher-income taxpayers, and greater for those who have enough income to pay taxes than for those who have none. What must be researched more in the year ahead are the feedback and multiplier effects. Basic incomes have been shown to boost work, productivity and incomes, which foster taxable income and lower social costs. But how great are those effects? All simulation models and cost estimates so far have ignored feedback effects. For instance, there is ample evidence that basic income security improves mental and physical health, which reduces spending on health services, improves productivity and reduces poverty. So, the net cost of a basic income would be less than the simple budgetary cost. But we do not have good estimates of how much savings would result. My conclusion from this review is that we will make progress most by focusing on building permanent capital funds, from which dividends as basic income can be paid, gradually rising as the fund grows. A feature of linking basic income to assets, or the commons, is that people can see a connection between the two, and are less likely to see it as a pure handout. The secret may be not in the idea but in the framing.